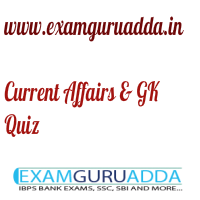 Dear Readers Examguruadda.in presents Current Affairs Quiz Questions and Answers of 5-6 April 2017 that cover important current affair events. Current Affairs quiz for IBPS PO,clerk, RRB-Po,Clerk, SBI, NIACL,Railways and SSC Exams. 1. Darcus Howe, the well-known black power activist has passed away. He hailed from which country? 2. Who has been chosen for the 2017 UNESCO/Guillermo Cano World Press Freedom Prize? 3. Which union minister has launched PowerTex India scheme to boost powerloom sector? 4.The Ntangki National Park is located in which state? 5. Who has been appointed the new chief justice of Madras High Court? 6.Kishori Amonkar, the renowned Hindustani classical vocalist has passed away. She hailed from which state? 7. Who has recently taken charge as new Deputy Governor of the Reserve Bank of India (RBI)? 9. Which country has become the first NATO member to launch self-contained cyber command unit? 10. Which state government has launched “e-nagarpalika” app to provide municipal services online?